Loralee Stock and Ethan Brenneman sign their letters of intent Wednesday at Sturgis Brown High School. STURGIS, S.D. - Two Sturgis athletes signed letters of intent to further their academic and athletic careers Wednesday. 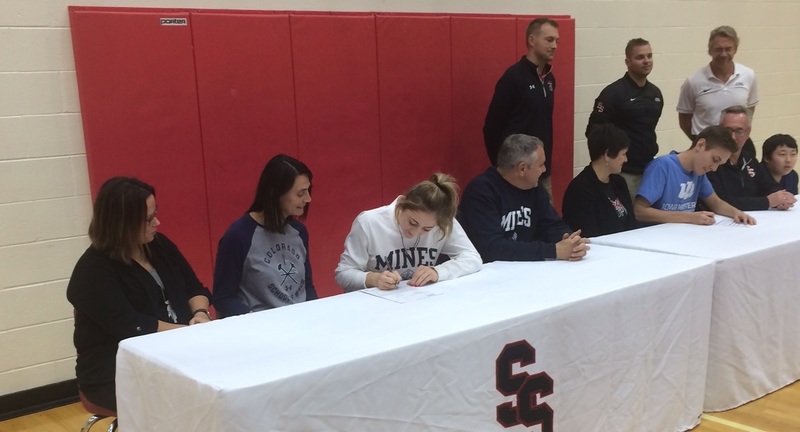 Loralee Stock signed a letter of intent to play basketball at Colorado School of Mines next year. Ethan Brenneman signed a letter of intent to run track at Iowa Western. Stock talks about her decision to attend Colorado Mines. "It was big decision and a lot of time on my part. But, overall, I am so happy and I love the school. I am going to a college that is really going to set me up to be successful in the future." Stock is also looking forward to her senior year at Sturgis as the Scooper girls tip off the season next Friday at Douglas. Brenneman also spoke about his decision to attend Iowa Western. "I am really excited to attend Iowa Western next year. I am also so blessed and so excited to be able to continue my career in running and looking forward to my future." Both athletes signed their letters Wednesday at a ceremony at Sturgis Brown High School.